When Jama’at-e-Islami (JeI) finally decided to fight 1987 elections as part of Muslim United Front (MUF), there were many challenges straight ahead. The biggest one was: whom to field from where. When Budgam’s turn came, everybody looked towards Mohammad Ismail Bhat, then 42. Ismail was one of the few experienced Arakeen (basic members) in Jama’at who had fought an election before. Ismail had fought 1977 elections unsuccessfully from Chadoora. Ismail’s rise through ranks within the organisation is akin to Jama’at’s trajectory in Kashmir politics. Born in a household frequented by Saints and Sufis, Ismail’s upbringing happened under his grandfather’s watchful eyes. After completing his primary education from Karalpora, he was sent to Barzullah in Srinagar. In 1963, Ismail completed his graduation from S P College in Srinagar, the same year he got married to Zoona Begum. The next destination was University of Kashmir, from where he completed his MSc in Mathematics in 1965. “He was first MSc Mathematics from our area,” recalls Ismail’s first cousin and friend Ali Mohammad Bhat, now 72. After coming out of university, recalls Ali, Congress’ MLA from Chadoora, Ghulam Mohammad Mir alias Mir Lasjan, offered Ismail a job. “He refused the offer telling him that his motive is to serve the people, not a job,” recalls Ali. That day onwards Mir Lasjan started looking at Ismail with respect, claims Ali. Instead, Ismail and his cousin Ali were influenced by Peer Saadudin (Tarabali), who had opened a darasgah (religious seminary) in Mochuwa. As teenagers, Ismail and Ali were the first ones to join Tarabali’s seminary. “Saadudin introduced Ismail to the real teachings of Islam, something his upbringing in a Sufi culture had denied him,” says Ali. When Saadudin, the first Ameer-e-Jama’at, introduced Jama’at-e-Islami in Mochuwa, Ismail instantly became a member. Within no time, Ismail rose through ranks in Jama’at-e-Islami, and became Ameer-e-Zila (Srinagar). That time Budgam was part of Srinagar district. In 1977, when Jama’at decided to contest elections, Ismail was their first choice for Chadoora seat. Ismail bagged just 518, against NC’s Abdul Samad Mir, who won with 13,103 votes. After Sheikh came to power, he began cracking down on Jama’at. But Chadoora remained comparatively unaffected because of Ismail. A few years later, people from Gundpora Chek and Dangerpora donated 65 kanals of land to Ismail for his dream project. “He wanted to construct a school, hostel, hospital and a mosque for the needy people,” says Ali. However, before he could have started the work, Ismail was arrested and sent to Central Jail Jammu in 1981. From there, he was shifted to Central Jail Srinagar for three more months. In 1983 elections, Jama’at once again decided to field Ismail from Chadoora. Once again NC’s Abdul Samad Mir won (13614 votes), while Ismail bagged just 871 votes. Then came 1987 elections and Ismail got MUF mandate to fight from Chadoora. This time Mir Mustafa, an independent candidate, won Chadoora by bagging 12920 votes, against Ismail’s 6347 votes. On March 30, 1992, Ismail’s son Mushtaq Ahmed Bhat alias Zubair, who had joined Hizb-ul-Mujahideen after leaving graduation midway, was killed fighting forces. “He (Ismail) is a pious man, why is he siding with the rebles,” Ali remembers army officer Duleep Singh telling him. But Ismail’s son Mushtaq was not the last one to join Hizb from his family; his nephews Manzoor and Showkat; brother Abdul Hamid Bhat and his uncle Abdul Hamid Bhat all died fighting forces during 90s. Even Farooq was frequently picked by forces and tortured, alleges family. On October 5, 1994, Ismail went to see functioning of newly inaugurated school at Gundpora-Chek, his dream project, where army had laid a cordon and gunned him down. “He jumped out of the window, but was killed before he could have ran away,” says Ali. 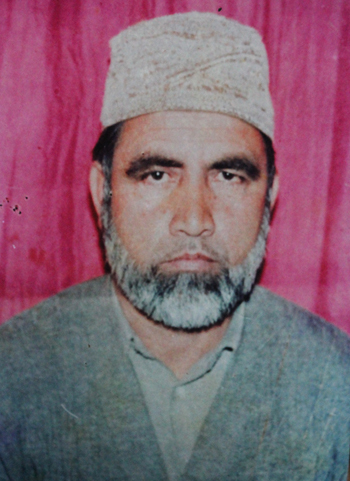 Later, Syed Ali Geelani termed Ismail’s killing a “big loss” to Jama’at-e-Islami. Mr Ismail sahab, u and me have landed on this planet at two different instants of time. i am not familiar with ur personality. but u must had remained a morally sound fellow. ur son mr Farooq sir is currently head of our school. his personal traits reflect ur rich n diverse thoughts and intelect as well. u have broughtup a pearl ,not a son. May God bless u. rest in peace..